A heroin “epidemic” is gripping the US, where cheap supply has helped push the number of users to a 20-year high, increasing drug-related deaths, the UN said on Thursday. According to the UN’s World Drug Report 2016, the number of heroin users in the US reached about a million in 2014, almost three times as many as in 2003. 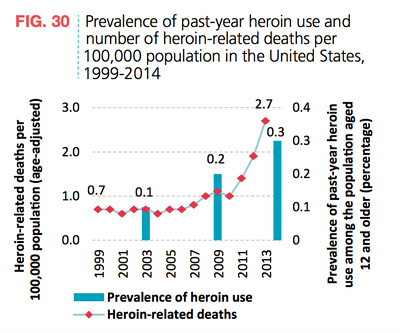 Heroin-related deaths there have increased five-fold since 2000. “There is really a huge epidemic (of) heroin in the US,” said Angela Me, the chief researcher for the report. “It is the highest definitely in the last 20 years,” Me said, adding that the trend was continuing. The rise could be linked to US legislation introduced in recent years that makes it harder to abuse prescription opioids such as oxicodone, a powerful painkiller that can have similar effects to heroin, Me said. 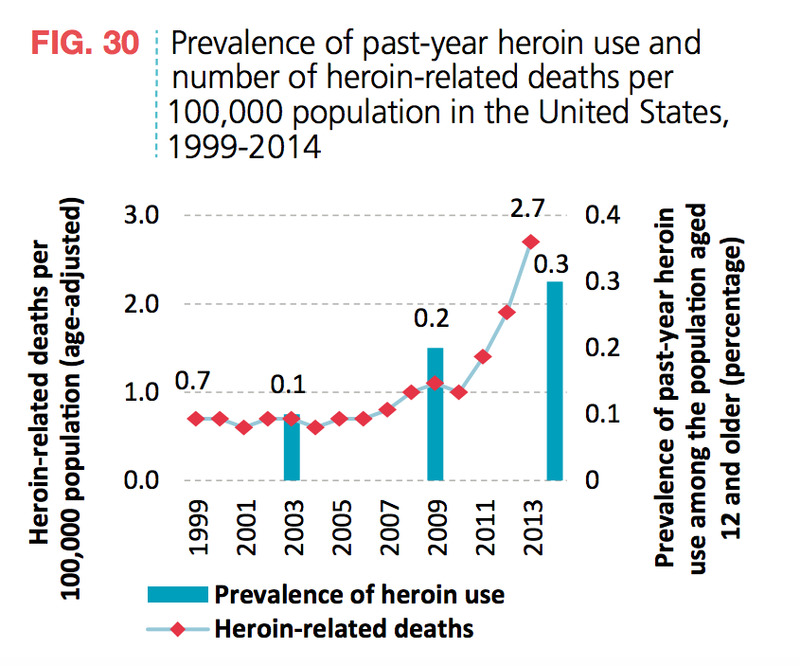 UN World Drug Report 2016Heroin-related deaths in the US have risen steadily over the last decade. Another reason for the increase in the use of heroin, which in the US mainly comes from Mexico and Colombia, is greater supply that has depressed prices in recent years, Me said. The shifting landscape of the heroin trade makes it hard to determine exactly where it is coming from and who is moving it, but the US Drug Enforcement Administration estimates that about 45% of heroin seized in the US in 2012 came from Mexico, while a little more than 50% came from Colombia. Perhaps more significantly, evidence suggests that the heroin-trafficking industry has shifted into the hands of multiple actors, rather than become concentrated among of a few powerful cartels. Mexican trafficking organisations “are not nearly as strong or monolithic as they once were,” Steven Dudley, codirector of InSight Crime, said in May testimony before the US Senate Foreign Relations Committee. 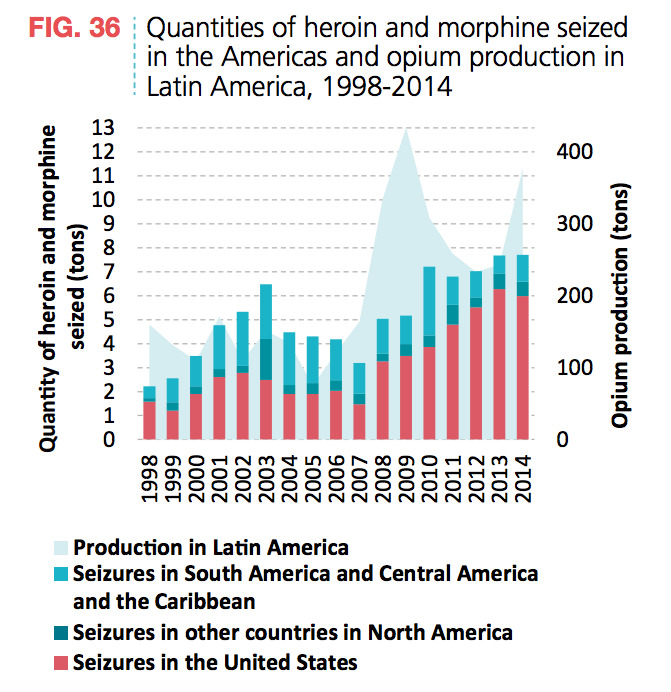 US World Drug Report 2016As heroin and opium production in Latin America has increased, so have seizures in the US. The fragmentation of Mexico’s criminal organisations backs up the idea that control of the heroin market has spread across multiple operators. In Guerrero state, considered a main source of heroin and opium production in Mexico, there are believed to be at least 50 criminal organisations operating. So while US herion use is up across the board — and while the powerful Sinaloa cartel likely controls much of the US drug market — the Mexican role in the increase of heroin use is the responsibility of multiple groups. The US has also seen a spike in deaths related to fentanyl, a synthetic opioid 50 times stronger than heroin and 100 times more so than morphine, according to the US Centres for Disease Control and Prevention. At least 207,000 deaths globally were drug-related in 2014, with heroin use and overdose-related deaths increasing sharply also over the last two years, according to the Vienna-based UN Office on Drugs and Crime (UNODC). DEA 2015 National Drug Threat AssessmentHeroin availability increased in every region of the US between 2008 and 2015, according to the DEA. US President Barack Obama earlier this year asked Congress for $1.1 billion in new funding over two years to expand treatment for users of heroin and prescription painkillers.